Little ones just love cruising around on their very own tricycles. While they enjoy speed, freedom of movement and the unique feel of wheels rolling underneath them, toddlers, preschoolers and even older children are developing important motor skills. 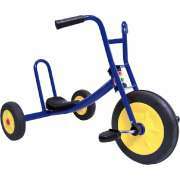 With a great selection of kids trikes, outdoor play becomes much more exciting. Which tricycles are good for preschool? Hertz Furniture&apos;s preschool tricycles are designed to help students move around and get out their energy in a fun and educational way. Our enticing models are built to support young kids who are just learning to pedal as well as older, more advanced riders. How can you help preschoolers develop gross motor skills? Children just love to move. They are constantly running around and climbing on things. When they are given time to play outside during breaks, make sure you provide some great equipment that will help them harness their energy into the skill-building activities that are so critical to early childhood education. Kids tricycles provide a fun and enticing way for preschoolers to refine many important skills that they will need throughout their lives. Riding a kids tricycle requires a considerable amount of coordination. 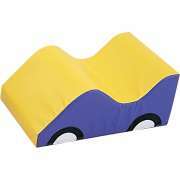 Children need to learn how to move the vehicle forward by pedaling while simultaneously steering in the right direction. 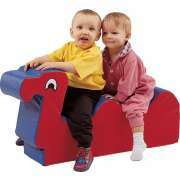 This highly-skilled activity develops gross-motor skills and muscles while promoting coordination and balance. When is the right time for a kid to ride a tricycle? 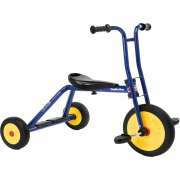 Kids tricycles are great for children of a variety of ages and developmental stages. Beginners and older toddlers who are just learning how to ride will require some adult assistance as they figure out how to operate a toddler tricycle. Older children who are already quite skilled in the basic principles of steering might enjoy a challenging course or track which requires them to put their skills to the test. When you supply young students with enticing equipment to play on, they learn that leading an active lifestyle is positive and exciting. Whether you take them on an outing to the park or just provide some free time outside, tricycles show children that recess is more than just play and exercise is worth spending time on. As they enjoy the fresh air and harness excess energy toward a constructive aim, your students will internalize the value of physical activity. While riding can be tons of fun, it is always important to make sure that the vehicles you choose are as safe as possible. We carry spectacular models from Foundations which are designed with a safety-first approach. 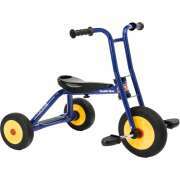 Our trikes are tip-resistant to accommodate those who are learning proper steering skills. Anti-slip pedals keep feet resting securely in place for smooth motion. What sizes do your tricycles come in? 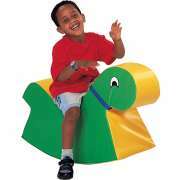 Having appropriately-sized riding toys is important for promoting proper development. 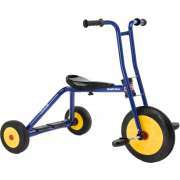 Kids trikes come with 10”-, 12”- or 14”-high so they can be enjoyed by children from ages two to six.There are different tricycle styles so you can choose the one you prefer, or provide a variety so children can choose. Typical models can be enjoyed from a regular seated position. Recumbent tricycles place the rider closer to the ground which provides better ergonomic positioning. Our chopper tricycle even includes a built-in back support so children can ride more comfortably. Do you have tricycles for toddlers? Our smallest tricycles can support children as young as two years old. When you get children started off young, they will get excited about moving around and being independent. Toddler tricycles will make a great addition to any preschool or daycare. 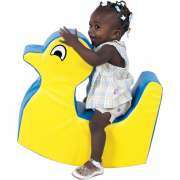 With Hertz Furniture&apos;s great riding toys and kids&apos; tricycles, you can help young learners harness their abilities in a fun and exciting way. Be sure to choose the sizes and styles that will fit the ages and sizes of your students. If you need help selecting the ideal model, or determining how many trikes to order, contact the Hertz Design Center for free project-planning advice.